The alveoli are one of the most important structures for getting oxygen into the body. They are small hollow sacs in the lungs that fill up with oxygen when we take breathes. Connected to these sacs are pulmonary veins and arteries. The pulmonary arteries bring blood filled with carbon dioxide from the heart to the lungs. The alveoli filled with oxygen make an exchange with the blood through diffusion. 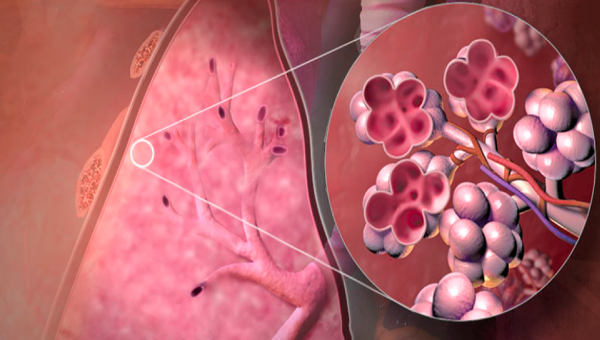 Once the alveoli take in the carbon dioxide, the lungs push it out as we exhale. The freshly oxygenated blood goes back to the heart via pulmonary veins. Basically, the alveoli are the main points of exchange between fresh oxygen that goes into the body, and carbon dioxide that we exhale. Smokers have trouble breathing because tar builds up in the alveoli so they can’t fill up with air properly to make oxygen exchanges.